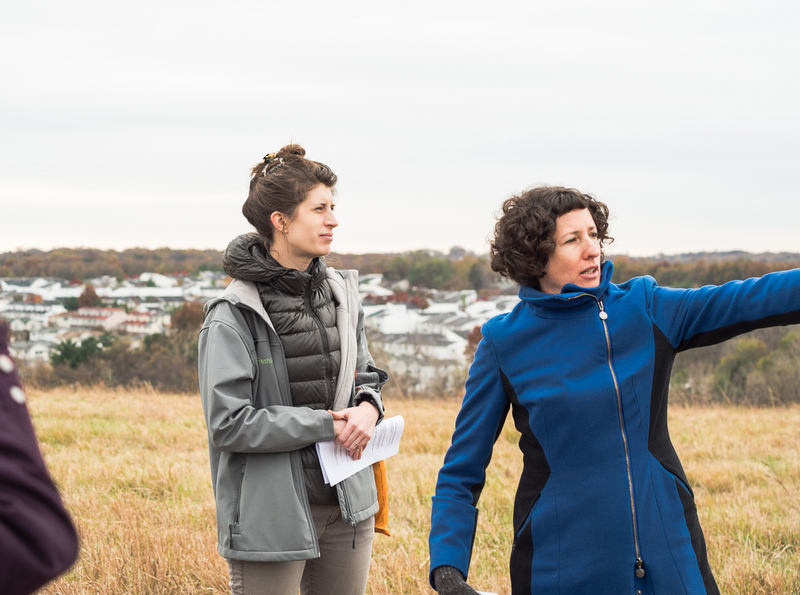 On November 18, Field R/D artist Lize Mogel led two bus tours of the park project. The tours expanded and resituated the typical park tour by offering an artist/ “counter-cartographer’s” perspective. 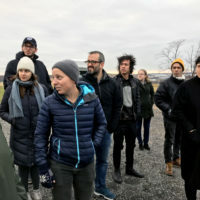 Joined by guides Dr. Cait Field, the Freshkills Park Manager for Science and Research Development, and Mariel Villere, Manager for Programs, Arts and Grants and co-organizer of Field R/D, Lize’s tour explored the landfill-to-park project within a longer trajectory of a changing urban environment. 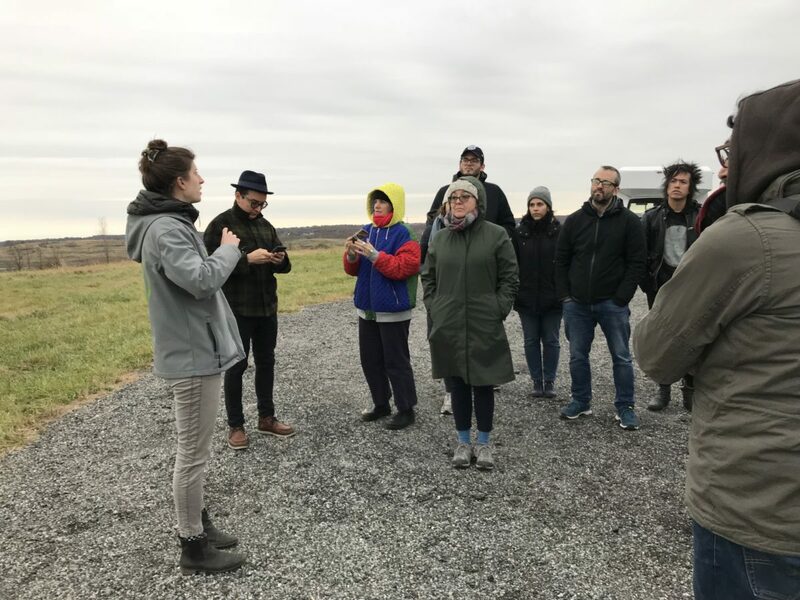 Winding through the 2,200 acres from active areas operated by the Department of Sanitation to meadows with clear horizons, the tour teased out the multiple layers of meaning of the site, and explored questions about the nature and production of landscape. 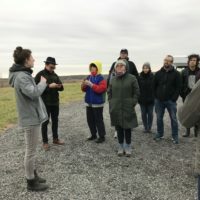 As a result of her experience in the Field R/D program from 2017-18, Lize wrote in her project proposal, “Freshkills is a multi-layered site that contains many things: the collective history of New York City’s refuse; landfill mitigation infrastructure; plant and animal habitat; and the promise of transformation. When Freshkills Park is fully built, it will offer a highly produced landscape and recreation experience. In the meantime, we have a unique opportunity to experience the site in its less-directed, wilder state, in which the site’s narratives are more visibly complex, less fixed. 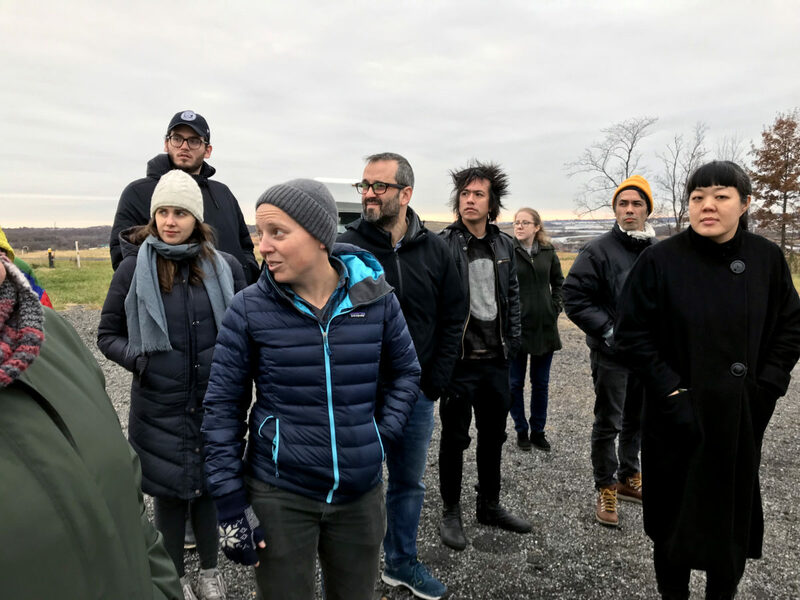 Freshkills, as a park, is still unformed in the public’s mind.” Lize Mogel’s project and tour experience exists in this in-between state. 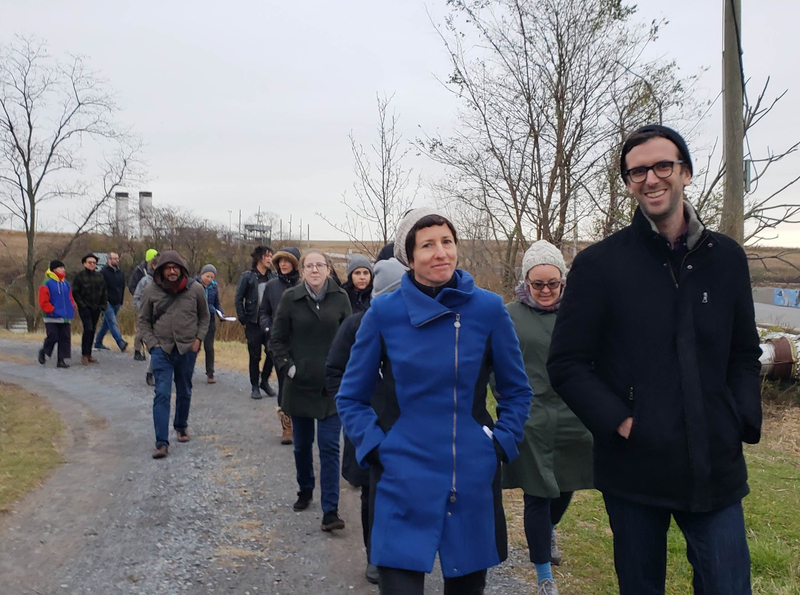 The tour looked at the constructed and natural infrastructure that has shifted the Freshkills ecosystem from landscape to wastescape and back to landscape again. Participants witnessed and experienced how the early stages of this very long-term project is already creating productive habitat for non-humans. 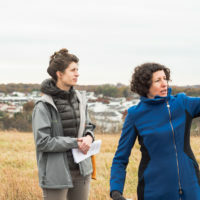 Through a researched yet poetic narrative, Lize expanded the group’s perspective of the landscape and the project timeline by relating the Freshkills Park site to the terminal moraine as it reveals itself across Staten Island, informed by geological expertise offered by Manager for Freshkills Park Development, Laura Truettner. 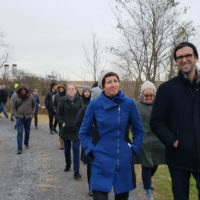 The group walked the waterline along the base of North Mound in silence and contemplation about the changing place, its sounds and sights. While still in New York City, everyone felt very far removed from the routine of urban life. This left the group pondering their role in the contexts of the larger regional and even global ecology, and the longer context of geologic time. Freshkills Park: Field R/D is a project to develop a visionary, community-responsive residency program for the former NYC landfill. 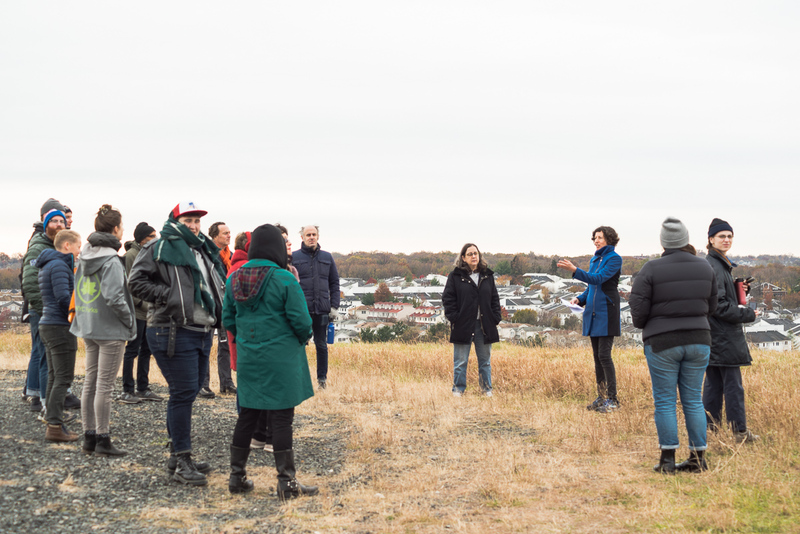 The exhibition “2200 Acres: Field R/D Artists on Regeneration at Freshkills Park” is on display at the Studio + Gallery until February 15, 2019.